Whether you’ve visited Long’s Park to feed the ducks, enjoy a picnic, mingle with the residents of the petting zoo, attend a music event or take in the craft show, you’ll probably agree it’s a special place. It also has a storied history, as it dates to 1900, when Judge Henry Grimly Long and his daughter, Catherine Long, bequeathed the 80-acre property to the city, making it a popular destination for city dwellers in search of green spaces. By the 1950s, the park had lost its allure. Weeds and brush obscured the lake. Picnic tables and benches had fallen into a state of disrepair. A nine-hole golf course had all but disappeared. The same can be said of visitors, as Sunday visitation had fallen from a high of 14,000 to less than 3,000. A newly launched organization – the Lancaster Sertoma Club – made the park its project. However, despite its efforts, the park’s needs constantly outpaced fundraising efforts (a cake auction brought in $37, while a circus raised $1,300). The next move involved chickens. Members who had helped with a barbecue sponsored by the Lancaster Poultry Association encouraged the club to host such an event. Willing to try anything, club members prepared 1,400 chicken dinners on a Saturday in October 1953. Tickets were priced at $1. The barbecue netted $700. History was in the making. Since then, the club has turned its signature event into the World’s Largest Chicken Barbecue (as verified by Guinness World Records). More than $2 million has been raised over the past 63 years. In addition to helping finance the beautification, expansion and maintenance of the park, proceeds aid speech- and hearing-impaired children and send at-risk youth to Kids’ Kamp. it takes an army to prepare and assemble 25,000 dinners and smoothly move traffic through the park. Fortunately, club members have been joined by more than 3,500 friends, co-workers and family who faithfully mark the third Saturday in May on their calendars. Club members have worked tirelessly to create four take-out express routes through the park. They’ve also partnered with community-minded companies such as Turkey Hill, Herr’s, Kegel’s Produce, Pepperidge Farm and The Hershey Company to create a dinner that is affordable for families, yet raises funding for the park. Hoping to entice people to stay and enjoy the park, the club is unveiling a new venture for this year’s barbecue: the Family Fun Zone. Sponsored by Big Bright Bounces, the area will feature inflatables, an obstacle course and more. Live music will also be offered in the park that day. 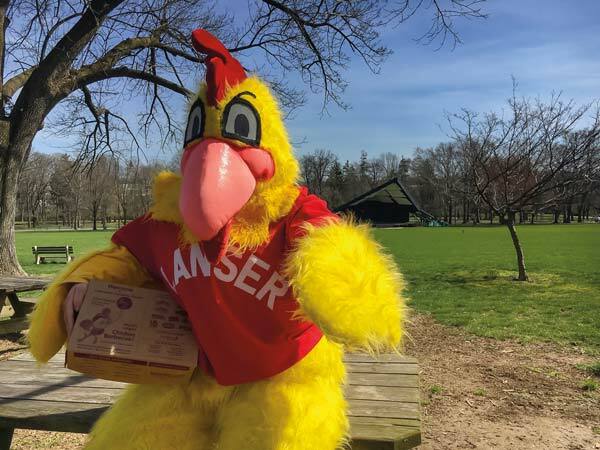 The 64th Annual Lancaster Sertoma Chicken Barbecue will be held Saturday, May 21, 10 a.m.-6 p.m. Advance tickets ($9) can be purchased through mid-May at Turkey Hill Minit Markets, from Sertoma Club members or online. Tickets can be purchased in the park on May 21 for $10. For more information, visit lancastersertomabbq.com.